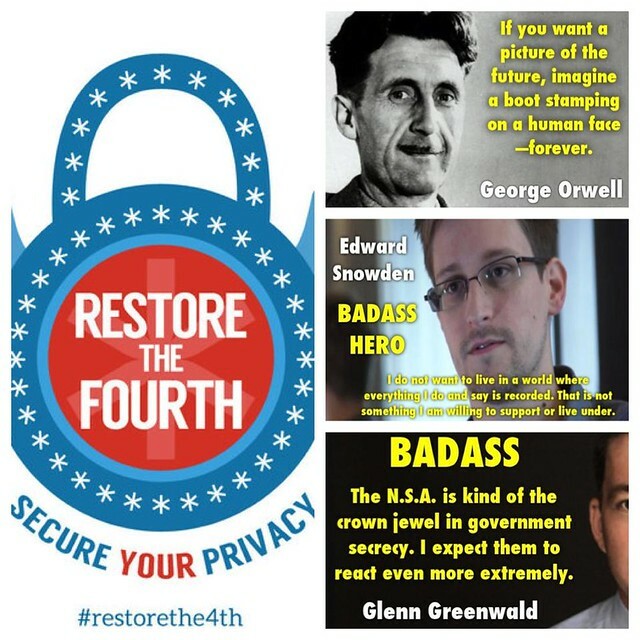 Here’s my EPIC thread contribution to the #Restorethe4th protest. As of this writing the NSA leak scandal has turned into an action-packed International Chess game at the Casino Royale. This story is (and has always been) bigger than Snowden or any other personality. This story is even bigger than the NSA. This story is about the leviathan power structure of global surveillance–the center of it is the U.S. National Security State. This has happened before, and it will happen again. Here’s my bottom line take on this issue. The Idealist in me is hoping that a sweeping reform of the Global Intelligence Community will be a result of the fallout of the Snowden NSA/GCHQ leaks. BUT the Cynical Realist in me doesn’t see any reform or progress in the foreseeable future. We’ve been here before since the revelation of ECHELON and numerous whistleblowers who had exposed the dirty secrets of the National Security/Surveillance State. Yet nothing has changed. Actually, there were changes, big technological changes which further improved the capability and efficiency of global snooping between nations directed at their citizens. Orwell was right. The Powers That Be will continue to stamp their boots on our collective faces as technology exponentially advances. That’s the nature of the Power Structure. It is what it is: A hydra-like leviathan; slay one head and out pops another — stronger, fiercer, bigger, angrier. When all is said and done, we’re better off working on our own personal salvation, or just continue to wallow in blissful ignorance, all the while loving and serving one another with the best of intentions, as much as we can. Can people in the 21st century imagine a greater invasion of privacy on all of earth, in all of history? If so, they merely have to wait for technology to catch up with their imagination. That’s all for now. Have a Happy Fourth of July. This was posted by c4chaos on Thursday, July 4th, 2013 at 8:24 am. Bookmark the permalink.